There was a distinct face of vengeance put upon God throughout the Old Testament. God was often portrayed as a great punisher, one who would discipline those who did wrong and help gain revenge against those who offended or harmed God’s chosen people. Early faith was expressed in the belief in a vengeful God who punished those who behaved in ways that the scriptures or cultural norms defined as wrong. In the mostly tribal cultures of the Middle East, past and present, the people sought an advantage over other tribes, and the God of Israel was rendered as the difference-maker who would give the faithful an edge over the idol-worshiping infidels next door. While we all want to believe God is on our side, and I believe that is an accurate assumption, it behooves us to carefully examine whether our side represents something that is Godly in nature. Would God really show preference for one group of people over those of other nations, religions, sexual orientations, or races? Granted, the Israelites claimed themselves as the chosen people of God, but was that actually played out in the Bible? It is clear to me that the Israelites had a relationship with God, which may or may not have meant God was willing to serve as a secret weapon against their enemies. Clearly, the Israelites were looking for security, and the face of God they felt they needed was one willing to be vengeful. God, however, seemed to have a different concept about what provided security. Sir Isaac Newton’s third law of physics states, “For every action there is an equal and opposite reaction.” In many tribal cultures, the norm is that you are either the attacker or the attacked. Little wonder that we see power passed back and forth, within and between succeeding generations. Could it be that the Israelites of old were simply experiencing the yet-to-be-named third law of physics? They would attack another nation and win. Another nation would attack them and Israel would lose. When they won, they praised their vengeful God for leading them to victory. When they lost, they attributed it to God’s punishment for their infidelity. What if God was neither helping nor hindering them in their violent exploits? What if God was simply allowing them to experience and learn from the natural consequences of their own decisions? Clearly, it is difficult for me to square the person of Jesus with a violent, vengeful God. As I switch my focus in the coming weeks from the faces of the God of the Old Testament to the faces of God in the New Testament, it will become clear that, in the end, God’s face is one of mercy and forgiveness. I have to wonder if the vengeful face of God is a face created by us in our own image. Note: this is the nineteenth in a series of Life Notes on the Faces of God. On the surface, this passage from first Corinthians seems to have little to do with love. It also seems to contradict Jesus’ teachings about our needing to become like little children in order to enter the kingdom of heaven. Childish love, however, is 100% conditional, as any parent of a 2-year-old knows. As long as the child is receiving everything he or she wants, in the way he or she wants it, and at the time he or she wants it, love is given freely and abundantly. At the first sign of not meeting what the child thinks he or she needs at any given moment, however, that loving bundle of joy can turn into a hateful, selfish demon who loathes your very being. There is an enormous difference between childish love and adult love (although some adults barely grow beyond a childish understanding of what love is and is not). Until we understand that love is an action we must either initiate or participate in, love will remain only an emotion that will come and go like waves crashing on the shore. Here is one way to understand Paul’s line above: If we think and speak with childish reasoning, our thoughts will not be mature. As we learn and grow, our understanding of love should deepen. Thus, as we reach adulthood we should put away our childish understanding of love as being conditional. On the other hand, we have Jesus saying things like, “Truly I tell you, unless you change and become like children, you will never enter the kingdom of heaven.” (Matthew 18:3) Jesus is talking about certain traits of children many of us feel obligated to lose as we become adults. Specifically, he refers to a loss of humility. Many of us give ourselves credit for being far wiser than we actually are. When we believe we know as much as is worth knowing about life and love, we lose our curiosity, our ability to continue learning, and our ability to love freely and trust completely. We retain the narcissism and other self-centered traits of childhood and become immature adults. In Paul’s words, we do not put away our childish ways. Rather, we put away the very characteristics of childlike love that prepare us for entry into the kingdom of heaven. The resolution for this paradox of becoming like a child, but also putting an end to childish things, seems to be in retaining key elements of childhood innocence and tempering them with the insight and perspective of adulthood. That combination will lead us to a deeper and more complete experience of love. Recently, I spent part of an afternoon in the kingdom of heaven. 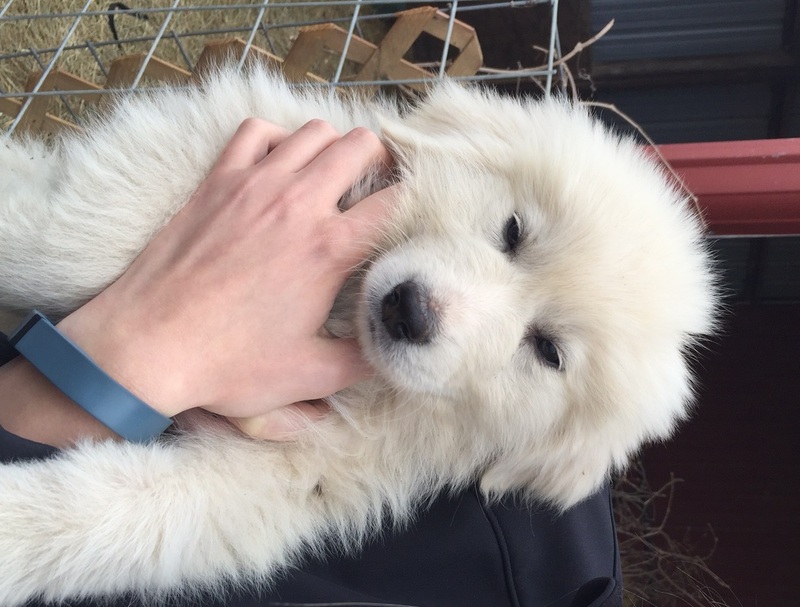 Our friends have two, nine-week old Great Pyrenees puppies, and my family was invited to share their company. What do puppies have to do with the kingdom of heaven? Quite a lot, I believe. Although there are no references in the Bible to puppies, Jesus refers to children many times in the Gospels, and often in the context of how we need to become like children to enter the kingdom of heaven. Therefore, the parallel I am drawing is between puppies and children, in that both have simpler, more inclusive concepts of love that they express with greater enthusiasm than their adult counterparts do. To the extent I am correct, we may need to become like puppies to enter the kingdom of heaven. In the presence of these adorable little fur balls, I felt heaven had come to earth. Never having seen (or smelled) us before, these puppies greeted us with their entire being. We were loved and accepted from the instant they saw us coming. Their enthusiasm and longing for our presence was palpable, as they jumped, licked, wagged, and pawed with everything they had. There was no inhibition on their part, just pure joy in their fellowship with us. They did not care about the color of our skin, how we were dressed, the sins of our past, our religious affiliation, or our sexual orientation. They were simply thrilled that we chose to spend time with them. And isn’t that what God wants from us? Pure, uninhibited longing to be in God’s presence? Why would God’s joy in such a reaction from us be any less than our joy in the reaction of these pups? How a young heart really feels, and why I love (her) so. How does a “young heart really feel”? Do we remember? Those of us hoping to enter the kingdom of heaven, whether during or after the present life, might want to spend time remembering. It is easy to forget the pure and innocent love and trust our hearts once had. According to Jesus, we should find our way back to that sort of love. How can we restore that uninhibited, unconditional, overly excitable puppy love? By stripping away the judgmental, biased, exclusive, and hard-hearted assessments we too quickly place upon others. Once gone, our hearts fill with the simple love and joy of children (and puppies). Come home to church this Sunday. Woof, woof!